As a brand-new brand from the well-known Blue Media Group, we’re pretty sure that Golden Lion Casino will soon pave its way to become a roaring success. Care to find it out for yourself? Read our review and discover what unique selling points Golden Lion has to offer. Golden Lion Casino is new to the online gambling scene, but with the Blue Media N.V. brand behind it, you can expect a first class experience from the minute you arrive at the site. This is a brand new online casino that was established in late 2016 and has been making waves ever since. At this casino you will have access to a wealth of online slots and casino games, all available directly via downloadable software or instantly from your desktop or mobile web browser. Golden Lion is home to over 130 traditional casino games, so players are spoilt for choice and, as the casino states, you will enjoy better odds than any land-based casino. Betsoft and Rival software power Golden Lion Online Casino, providing innovative graphics and sound effects, smooth and seamless gameplay and plenty of lucrative chances to take home some rewards. Security is the highest priority at Golden Lion and features the most advanced security measures available for complete peace of mind. The casino is licensed and regulated by Curacao eGaming, and its games are regularly audited by external agencies to ensure a totally safe and fair online gambling experience. 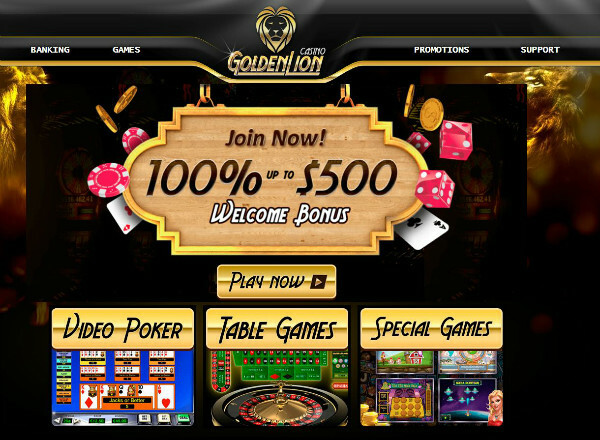 Players can access Golden Lion Casino games in three standard ways. The quickest option is the instant play software, that allows you to visit and play at the casino directly from your web browser, and is compatible with Chrome, Firefox, Safari and any other browser you may be using. You will simply need a solid Internet connection, and you're good to go. All you have to do it visit the website, log in or register an account, and you can start your winning journey right away. 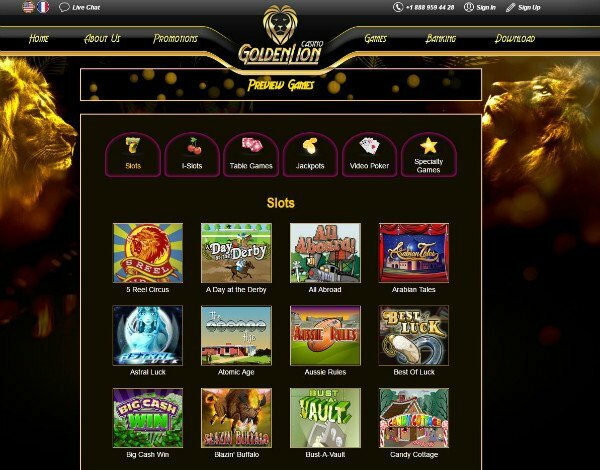 As mentioned before, Golden Lion is home to over 130 online casino games, with a bulk of these being online slots. Powered by Rival Gaming and Betsoft, you will likely find a popular title that suits your needs and budget. The games are divided into several categories for easy navigation, including Slots, I-Slots, Table Games, Jackpots, Video Poker and Specialty Games. You will find the Rival-exclusive I-Slots among the selection, which includes some fabulous progressive slots attached to a life-changing jackpot that could be struck at any time. A few of the most demanded slot titles are Flying Colours, All Abroad, Flea Market, Fast Lane, Astral Luck and Candy Cottage. If table games are what you seek, the casino features some classic games as well as modern version, including all-time greats like Roulette and Blackjack. Video poker fans can enjoy games like Aces and Faces, Deuces Wild, and more, while speciality game enthusiasts can try their luck at Keno, Sudoku and several scratch game options. Finally, the live casino is available for players in search of a more authentic and realistic experience where you play against live dealers in real time. Think of the name 'Golden Lion'. Whatever images pops into your mind is exactly what this casino emulates. Players can enjoy a sophisticated and stylish experience at this casino, with just the right amount of glitz and glamour to attract a broad range of players. The casino follows a somewhat typical look and feel, with gold details set on a black background. The homepage plays to the theme of the casino is the best way, while two images of the mighty king of beasts give the casino a more majestic atmosphere. The homepage keeps it simple regarding activity, with just the main menu and some of the casino's best features taking pride of place. This makes things more user-friendly, functional and aesthetically pleasing. Offering exciting and rewarding promotions are the casino's way of enticing both new and existing players to keep playing at the casino. That being said, Golden Lion offers a range of promotions and special offers that are either ongoing or that run for a limited time. 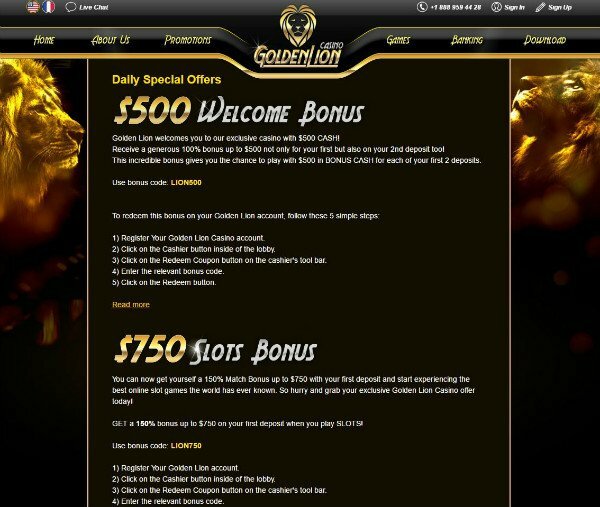 The welcome bonus is always one of the main features at any online casino, and Golden Lion is no different. Join the casino today, and you will receive a generous 100% match bonus up to £500 on your first and second deposits. This means that you get to play with £500 in bonus cash for each of your first two deposits, adding some much-needed cash to your bankroll right off the bat. To receive this offer you you to use the Golden Lion Casino bonus code: LION500. The Slots Bonus lets you earn a 150% match bonus up to £750 on your first deposit to use on the massive range of online slot games available at Golden Lion Casino. All you have to do is use the bonus code LION750 to claim this fantastic bonus. To receive this offer you you to use the Golden Lion Casino bonus code: LION750. The casino is also currently running numerous offers on a range of online slots, where you use a specific bonus code to claim various rewards. There are also bonuses afforded to card players, where you can make a wish while playing your favourite card game, use the bonus code and earn some great rewards. Golden Lion runs various slot tournaments on a weekly basis where tons of exciting prizes are up for grabs. Tournament prizes change depending on the featured game, with real money players have more options to choose from. This is an exciting way to measure your casino skills against other players, all for the chance to win some extra rewards. Golden Lion is on top of its game when it comes to banking, and offers many convenient depositing and withdrawals methods. All transactions are safe and secure and protected using the most advanced SSL technology, providing the highest level of security. Depositing funds into your account is quick, easy and hassle-free. The casino accepts Visa and MasterCard payments, as well as PaysafeCard, Skrill and Neteller. The casino requires verification for all first-time depositors, and this is done over the phone. You may set a deposit limit as a way to monitor your expenditures at the casino and can be increased only with 24 hours’ notice. Withdrawals are just as simple. All withdrawal requests must be reviewed and approved by the casino before being processed, which can take up to four business days. All withdrawals carry a processing fee of £50 per transaction. In addition to game options, software, and security, customer support is one of the most important factors of any business, with particular attention paid to the online gaming community. Since everything is done online, the need is greater for efficient and professional customer service to meet the needs of players from all over the world. Players at Golden Lion Online Casino can contact the customer support team via the live chat function, email or telephone for fast and helpful assistance. Golden Lion seems to be a casino that takes its job very seriously. The design of the casino alone tells us that care and precision were taken to provide players with a top class environment in which to play their favourite games. Players will immediately feel a sense of security when they enter the site, while an extensive list of casino games and promotions will keep them entertained for hours. That being said, thanks to all the hard work that has been put into developing this exciting new casino, we predict that the Golden Lion Casino will soon become a roaring success. Does The Casino Golden Glory Review Sparkle?